I’m sure you’ve seen this story in the news this week – a server at Applebee’s took a photo of a receipt left by a customer and started a social media uproar. The server posted the photo to Reddit and the Internet community kicked into gear. 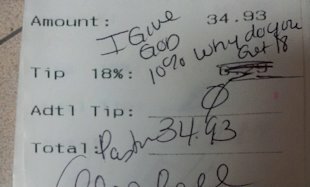 The pastor who left the receipt found out the note was going viral and called the Applebee’s, who fired the server, who didn’t serve the customer only took a photo of the receipt and posted it. Applebee’s fired the server who posted the photo, saying that customer information, such as receipts, is private information. That evidently wasn’t good enough for Twitter and Facebook users, who stormed Applebee’s social media channels with vitriol. 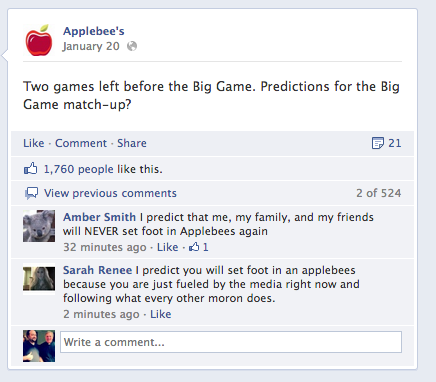 This was posted a week ago, and has fallen way down the Applebee’s Facebook page. This backlash has forced Applebee’s to post not one but two posts explaining their actions over the last two days. After the story went national, they’ve also taken to Twitter, replying to each user who was posting replies to them. With most social media crises these days, the people will get bored after a few more days and go away. Applebee’s is handling this as best they can, short of re-hiring the waitress they fired, but it will be interesting to watch what, if any, the long-term effects will be. I guess we can watch their earnings report next quarter to see if indeed the people who said they were going to stay away did, or were just being part of the crowd. Next Next post: Should academic departments get sub-domains?